27th March 2011 – Our Day-2 at Hampi began at about 6 in the morning; we decided to head out to the river to get a glimpse of the sunrise before the boat service can take us across. The sun was rising up and afforded us an opportunity to shoot some pictures. While waiting for the boatman to start his morning; noticed these white puffs reflected in the water. 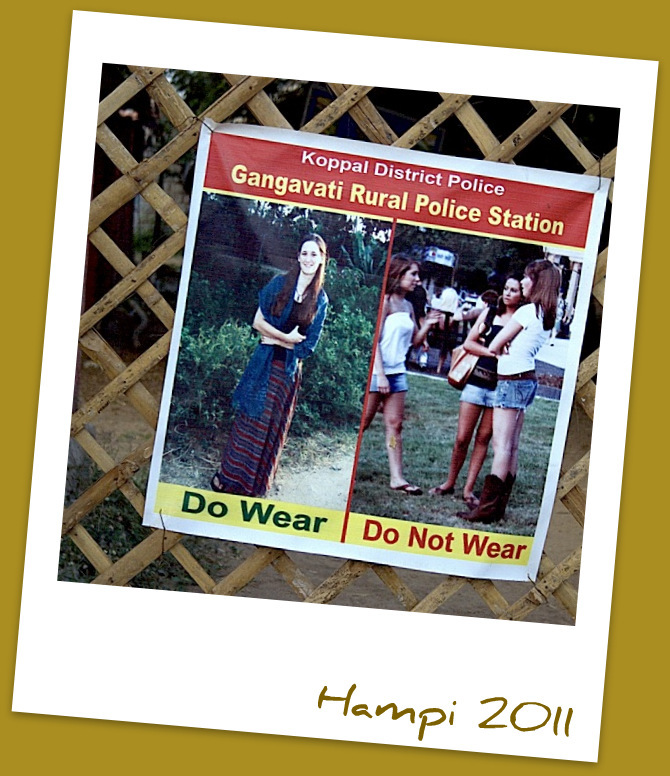 These posters were put up everywhere in Hampi by the local police. In fact there were loads of such rules and regulations painted on the reception wall of many resorts out there as a caution for the tourists against bad elements, etc, much to our amusement!!! 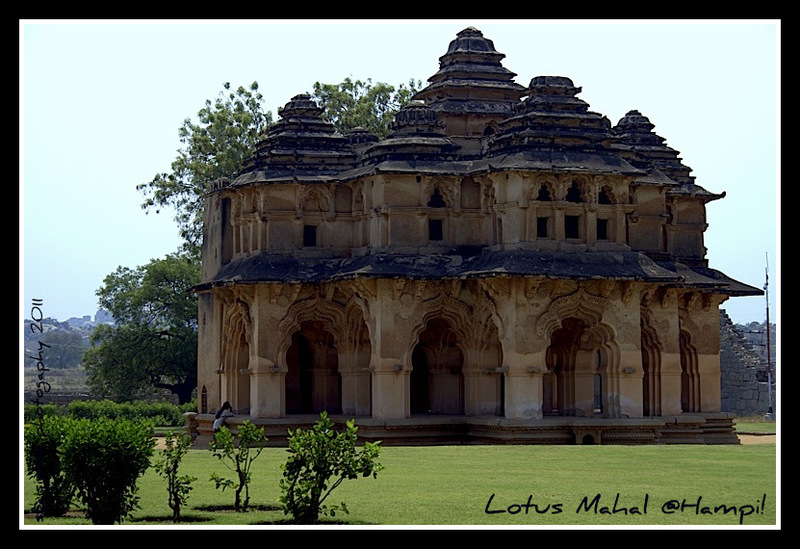 Hampi comprises of some zones and clusters of villages. The most popular amongst these are the Sacred Centre (where the religious sites are situated; Royal Centre where the royal and the courtly structures (Queen’s bath, elephant stables, lotus mahal, Hazarrama temple) are placed; Islamic quarters which was the residential area where the Muslim officers of the vijayanagar army lived. Then there are some small villages like Kamalpura, Anegondi, etc. We wandered across to the market place and started haggling with the first auto we spotted; he agreed to take us all over for 300/- for 3 hours. We planned on covering as much as possible as this was our final day here in Hampi. And boy were we spoilt for choice – everywhere we looked, every street we went up – we could see monuments, temples, ruins……… We were wishing for 360 degree view for our eyes as we were constantly swinging around our necks to get a maximum dekko of this beautiful heritage site!! 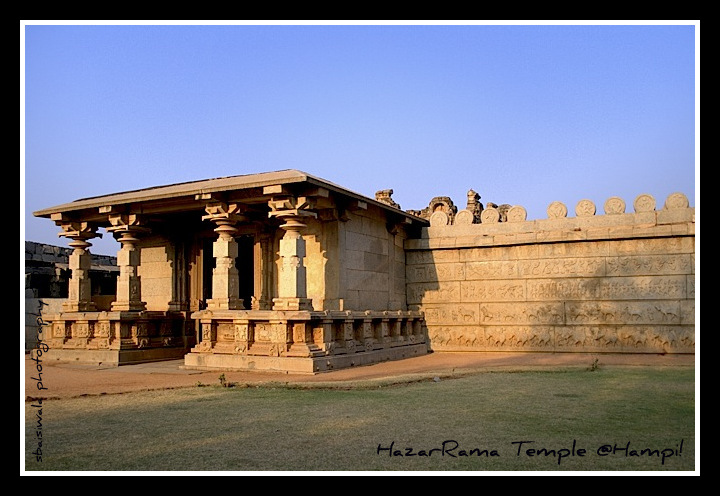 The first spot we came across was the HazarRama Temple : “This is the only temple situated in the core of the royal zone between the ceremonial and the residential enclosures. Dedicated to Vishnu in his aspect as Lord Rama, this 15th century temple, is the finest example of a compact Dravida Vimana type of temple. Its knows for its sculpted friezes depicting the Ramayana, in three tiers, running all around the main shrine, and the narrative sculptures of Lava-Kusha story on the devi shrine.” A beautiful green stretch covered this monument on two sides, bordered with fragrant champa trees. We strolled into the compound which was deserted as it was too early in the morning for the tourists. A peaceful, serene place with some very gorgeous carvings, pillars and architecture. 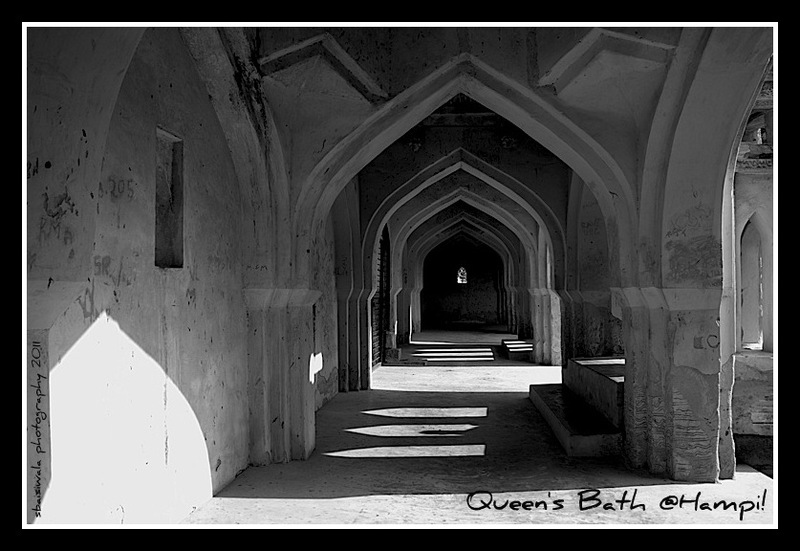 Next we ventured onto a graceful piece of architecture – The Queen’s Bath. Though this is called the queen’s bath; in all probability this was an area used by the king and his wives for their pleasures. The gracious architecture of the inside more than make up for the starkness for the exterior of this building. Gorgeous balconies project out into the pond from all sides with arched windows; the base of these are supported by brackets in the shape of lotus buds. The central pool is open to sky and one can just imagine this being filled with perfumed water and flowers for a royal bath. The verandah encompassing this pool has beautiful domes and arches – all a true example of some enchanting architecture. Tired out, we begged the autowallah to suggest some good eating joint nearby; he came through with flying colors for us. We ended up at a small joint which served some amazing south indian fare of idlis, dosa and filter coffee. 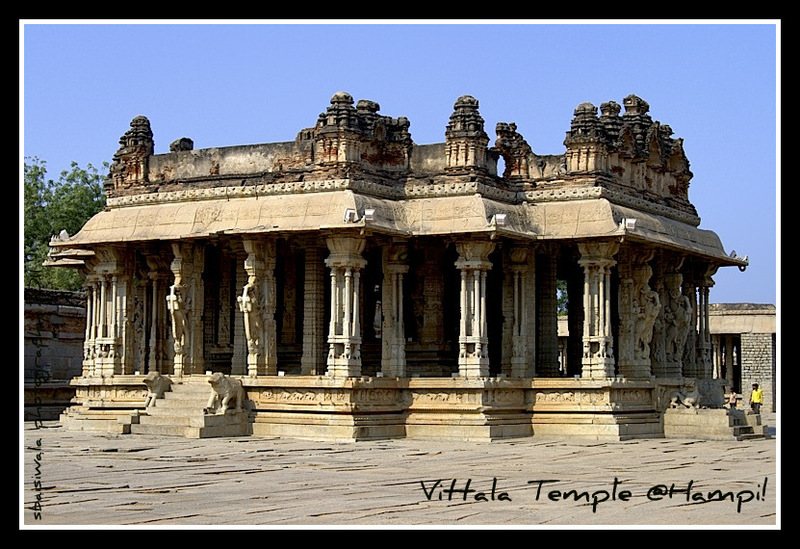 Sated, we set off for the main destination of the day – the Vitthala Temple. 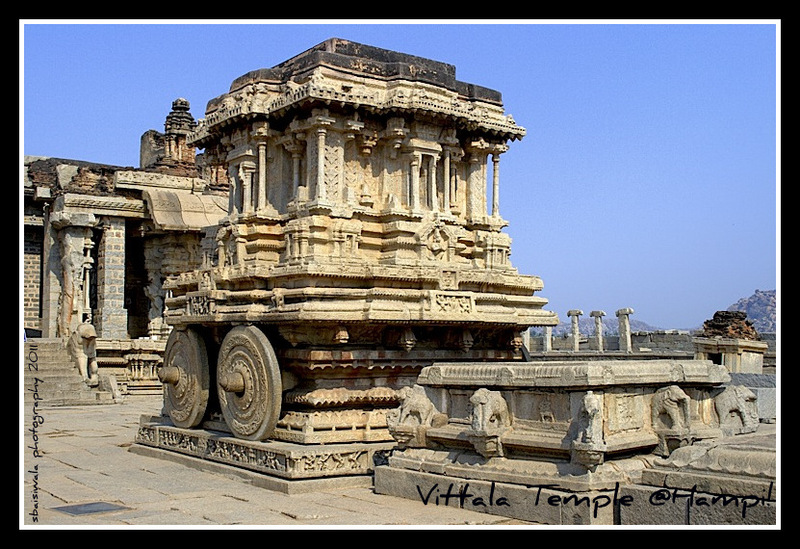 The Vitthala temple complex had a surprise for us; there were battery operated carts which ferried tourists from the main entrance to the temple complex for a mere fee of 10/-. It was a delight to see that Indian heritage sites are employing clean, green facilities for the ease of the tourists – applaud the tourism department on this achievement. 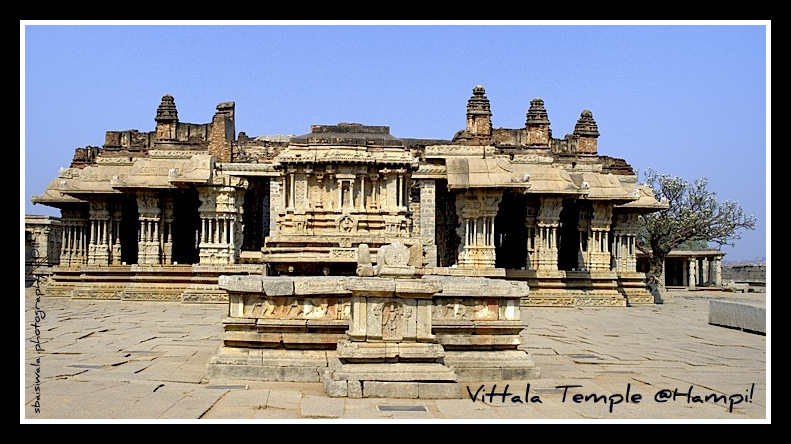 The Vithtala temple, represents the highest watermark of the vijayanagar style of art and architecture. Vitthala is the Krishna aspect of Lord Vishnu. It is one of the largest temples of that period, built under the patronage of Devaraya II (1422-46 AD). 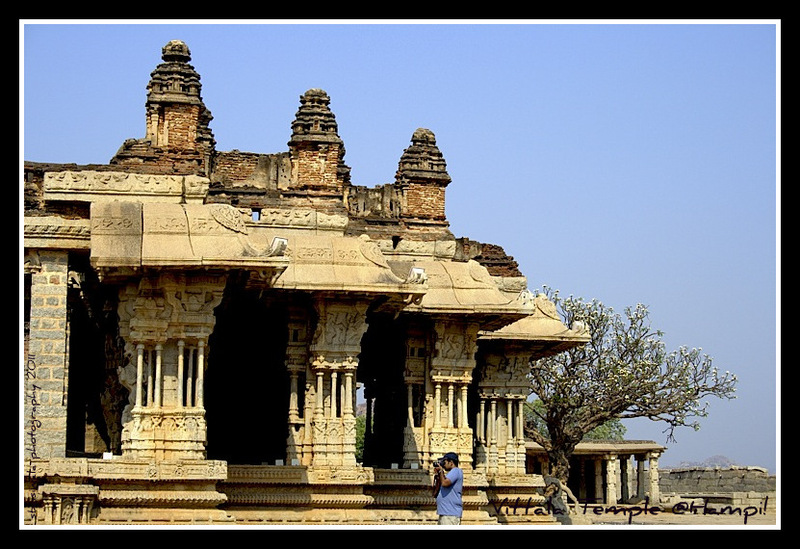 The hundred pillared mantapa (pavillion) to the southwest of the main temple, and the Eastern and Northern gateways, carved with depictions of Vishnu and his other forms, are attributed to Krishanadevaraya and his queens. The temple is built on an ornate plinth. The composite pillar of the sabha mantapa (congregation hall) are massive, hewn out of single granite blocks, which are designed as clusters of slender pillars. Some of these when tapped gently, produce musical notes. But the piece-de-resistance was most undoubtedly the massive stone chariot, placed in the central courtyard. The sheer size of this sculpture takes your breath away; on top of that the exquisite carving work and the details are simply mind-blowing. It’s a reproduction of a processional wooden chariot and houses an image of Garuda – the vehicle of Lord Vishnu. The long path winding from the main entrance to the temple is lined with a pillared complex, in ruins now, and some other structures which are all part of a huge bazar. We walked out of this complex, awe-struck!! 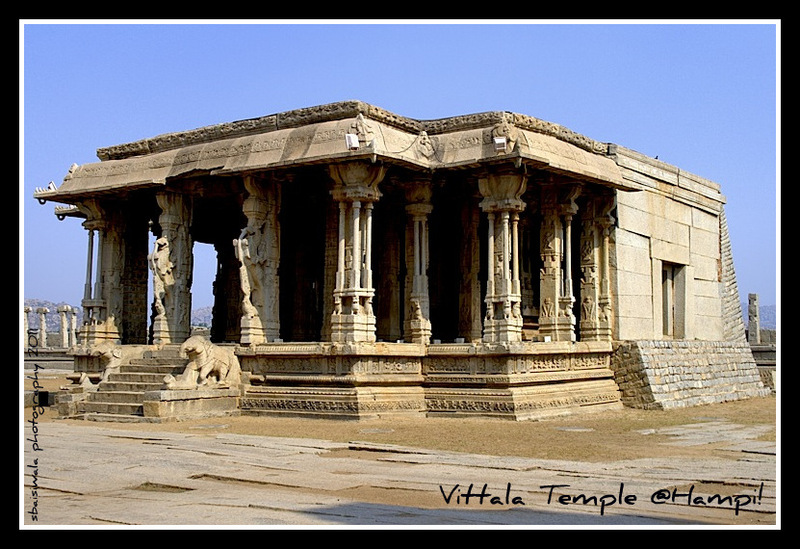 I think I for one will definately visit Hampi once again – just for this awesome temple complex. We gorged on some nariyal pani outside the temple complex and then continued on towards our next destination. Enroute we stopped tp click some pics of a massive gateway called the Talarighatta gate. Our next stop was the Zenana Enclosure where we visited the Lotus Mahal or the Chitragani mahal.Since its inside the zenana quarters, its assumed to be a socializing spot for the womenfolk of the royal family. The gorgeous structure is surrounded by a verdant green patch of well-manicured lawns with plenty of huge trees. We all sprawled under the shade of one such tree to admire this beautiful piece of architecture with its ornate arches and windows. The archway and the balcony with the domed construction resemble a half-opened lotus bud- hence the name. 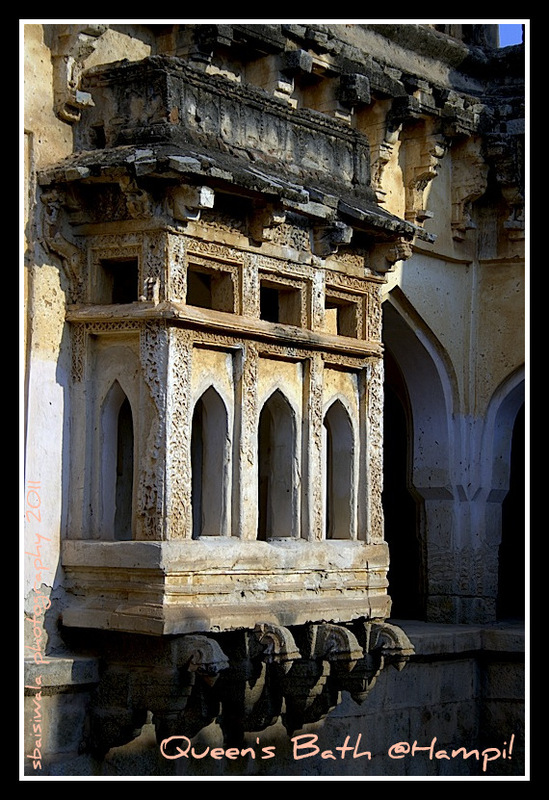 The decorations and architecture is a curious mix of Hindu and Islamic styles. Our final destination for the day was the Elephant stables – another beautiful architectural structure with immense grace and style. 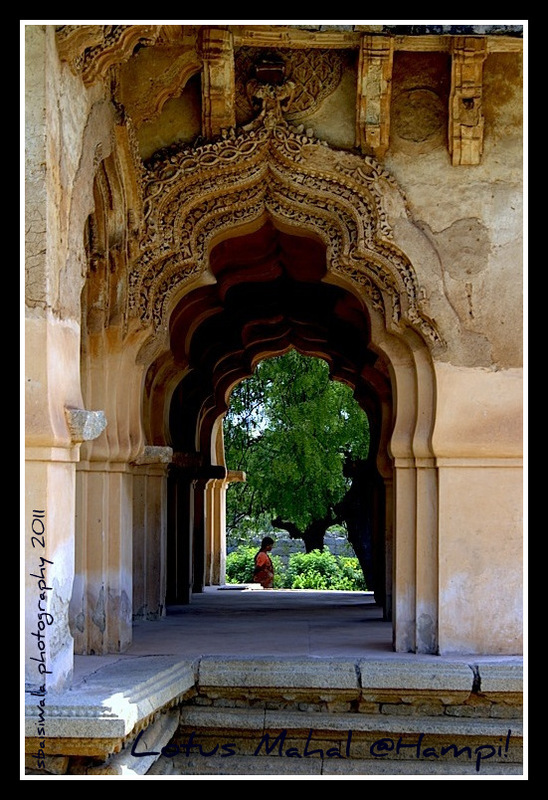 Its built in the Indo-Islamic style in the 15th century and comprises of a long rectangular structure with eleven large domed chambers – all connected via the huge arched openings. The domes are of various types – circular, octagonal, ribbed, and fluted in design – all laid out symmetrically in a pattern. Our trip ended with a funny meal at one of the roadside cafe’s in the main market wherein we dug into an assortment of items from pakodas to cheese sandwiches and the worst was the boiled and mashed chana impersonating to be Hummus!!! The best part – we devoured this as well. We took the night bus back to Bangalore but in our hearts we knew we have not had our fill of Hampi – one needs to spend at least a week here to savour it in its entirety!!!! 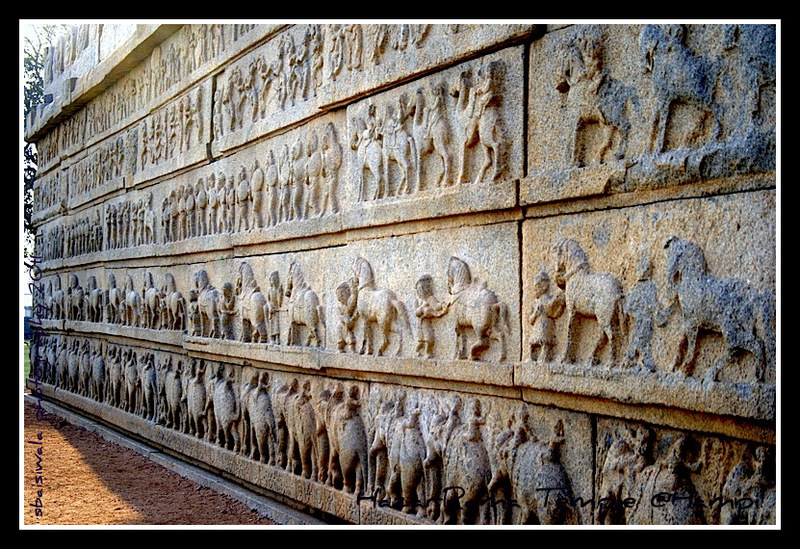 liked those photographs of hampi…thanks for posting…really helpful article…stunning pics..
Hampi is a treat for me and each time I visit and explore this historical place; it instills a sense of pride with deep appreciation to the art in the form of sculptures. The Photos taken and shared are amazing. Thank you so much for reading and viewing my blog. Next Post Death by Chocolate!!! !